New & Improved Way To Support Your Favorite Blog! Uncontrolled gleeful trembling is the most common symptom upon learning the Big News that there is a New & Improved! way to support the blog! You know this method must be good because of the exclamation points! Gone are the old clunky forms and necessity of using Paypal. In is the simplest possible tool. Just fill in your email and credit card number and voila, you’re done. A peek at what the form looks like is at the top of this post. Click here to go to the (encrypted!) Donations page, or use the menu bar under the header image to see it in the flesh. There are two ways to help: Donations (enter any amount you wish) and Subscriptions (charged monthly; again, enter any large amount which pleases you). I’m deprecating Paypal. 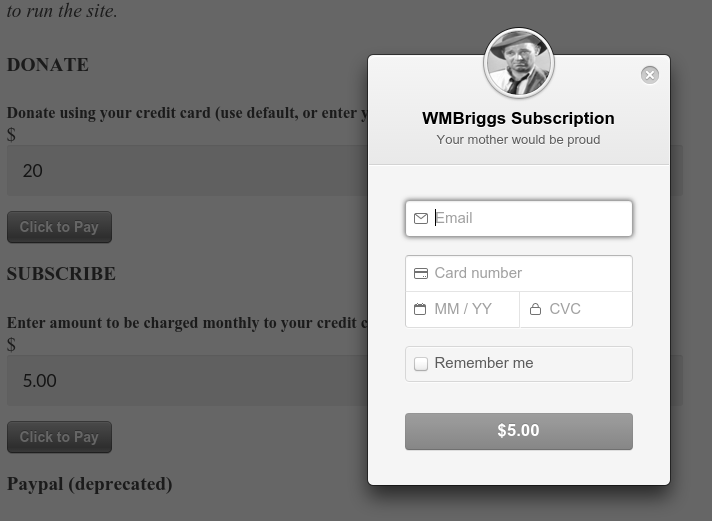 Subscribers who use it may continue to do so for as long as they wish, but new subscribers should use credit cards. I’ll be emailing Paypal users to let them know they need change nothing, or they may switch to the new way. …and also to me. Don’t forget Yours Truly is, except for two weeks a year, is completely totally positively entirely unconditionally independent. Which is a polite, euphemistic way to say we’re on our own, dear reader; it’s just you and me. Daily posts on topics from marbles to music, from homeopathy to holidays, from fallacies to forecasts, from probabilities to progress. Yes, and many, many more, with a special focus on the exposure of silly scientism with surrounds us. Podcasts are back, now on a weekly schedule (every Wednesday). These are available at YouTube (audio only), and here by MP3, which you can subscribe to using your favorite service. My book is ever-nearer publication, and once it is out, since I cannot be trusted to stand in front of a group of students, because I would tell them hypothesis tests should never, ever be used, that p-values are magic and useless as evidence, that scientists, especially in complex fields, are far more self-certain than they have any right to be, that questionnaires designed to quantify the depths of thought are either silly or harmful, that probability is in our heads and not in things, and many other similar undesired realities, I will instead teach here. Pre-recorded speeches have their place, but they always suffer in comparison with live lectures in front of real audiences (students). Every time I give the “same” lecture it is different, because the group steers the course of the words. This obvious fact is why on-line “degrees” (note they never say education) will always pale next to classroom instruction. Nevertheless, we’ll work with what we wot, what? I give ’em. Yes, and talks, seminars, full-bore classes and short courses, too, all priced unreasonably and all cheerfully delivered. The range of topics is the same found here. I have hats for all seasons and am a seasoned traveler. But I would also love to come into your company (assuming you have one) to show you, if you use statistics in any way, including machine “learning” algorithms and the like, why you are too sure of your results. This message, true as it is, is never welcomed. How odd. God bless you all for sending them in, alerting me of scientism, bad science, diversity run amok, and the rest. I am about two years behind in these. Keep sending them, however. I’m working on it. We decided today on the subtitle of the book, which will at least make searching for it easier. Uncertainty: The Soul of Modeling, Probability, & Statistics. “A peak at what the form looks like. . . .” Not a prominence, but a quick look–double e.
My enemies want to starve me. Perhaps Paypal charges you too much, but it allows me to separate my hobbies from the family credit card, painlessly. On Climate Hustle: Wyoming does not does not rank a showing. I’m sure there are others, too. Book? Has Mr Briggs written book? I will buy the regular copy but if there’s an audio version, maybe numbers don’t lend themselves to that, but I’d be interested.